What's better than chocolate on Valentine's Day? For those of us caring for people with nut allergies (or who have nut allergies ourselves) it can be difficult to find chocolate that is not only nut-free but also delicious. Internet shopping to the rescue! Luckily, there are a few really good nut-free chocolate candy companies out there with everything we need to treat our kids or ourselves. You may have heard of some of these before but for those of you who haven't they definitely bear repeating! First up is Vermont Nut-Free Chocolates, one of my all-time favorites. I've ordered from them numerous times and every product I've tried is absolutely delicious. Best of all, both of my daughters go ga-ga over this stuff! This is true gourmet chocolate at its finest. Plus, there are many Valentine's Day-themed chocolates that will make your child's day! In fact, Vermont Nut-Free has pretty much every holiday covered in terms of chocolate. 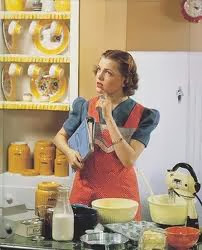 They also offer great baking chocolate if you want to whip up a homemade treat. Check them out and tell them I sent you: www.vermontnutfree.com. Next is Divvies, a fabulous nut-free candy company that is also egg-free and dairy-free. They have all sorts of Valentine's Day themed goodies and a great array of candies in general. I also like them because they offer a choice for people dealing with multiple food allergies. Here's a new one that I just discovered recently from a blogger bud. Check out No Nuts About It Chocolate. They're nut-free and offer a delightful looking array of chocolate. The cool part about them is that they also will custom-make chocolates for you, using a custom mold that you help create. How fun is that for parties, weddings or school events? I haven't tasted this chocolate yet, but according to their web site, they create chocolate in the "Belgian" style. Yum. Sounds good. I was also contacted recently by Sweet Delight Nut-Free Chocolates. Created by the mother of an allergic child, these chocolates are egg-free as well as nut-free. They have gift baskets for V-Day and themed candies as well. I haven't tried these yet either, but I will soon. Hey, this chocolate research is a tough job but someone's gotta do it! Finally, many of you have tried Enjoy Life Foods chocolate treats. These are free of the top 8 food allergens as well as sesame and sulfites. Check out their website for Valentine's Day themed recipes using their delicious, allergy-friendly chocolate products! Early next week I'll have a roundup of online allergy-free bakeries. I have some favorites but if you know of a really good one that ships across the country, let me know! P.S. Don't forget to follow me on Twitter! My handle is Nut_FreeMom. Hope to see you there! Yesterday I received many notifications about the Wall Street Journal food allergy article from friends and blog readers. Thanks everybody, 'cause this story is one we don't want to miss. Please read the story for full details, but here is my take on it. First of all, I'm picturing allergist's phones ringing off the hook today from parents of food-allergic kids asking for new tests or more clarification. And that's who we should be calling: a board-certified, qualified and experienced allergist. I caution everyone not to put too much stock in all of these studies, articles and whatnot until we have much more scientific evidence. The bottom line is that life-threatening food allergies are a phenomenon that is still not understood very well, even by the experts. It doesn't serve our children, or ourselves well, to second-guess our child's condition each time a new article comes out. It's tempting to do so and for people who've never witnessed an actual reaction, I say, get more info from your doctor. The article in WSJ quoted some of the top allergy docs in the country--people that I respect. These guys are not alarmists, nor are they dismissive. They see numerous cases every day and every year, so I appreciate their input on this story. The gist of the article is that there is some evidence that food allergies may be over diagnosed in some cases. That makes sense to me and it doesn't point to the fact that food allergies don't exist. Two different things could be going on here at the same time. For one thing, more kids are going to the hospital and being diagnosed with food allergies following a severe reaction. That can't be discounted. More people--adults and kids--are having severe allergic reactions to food. Who knows why, but a reaction doesn't need a blood test to prove anything. Identifying the food that caused it is enough. Dr. Sampson is quoted as saying as much in the WSJ article. Witnessing a severe reaction is what brought my family to the allergist with our first child. However, here's the second thing. Once a child has experienced the reaction, subsequent children in the family are tested--even before they have a reaction. For example, in my family we were told to avoid giving our youngest any peanut butter products before 3 years of age--simply as a precaution. This was because my oldest had experienced a life-threatening allergic reaction. Then at 3, my youngest was tested for all known food allergies. She came up with all negative results. Obviously, I was elated. But here's the thing--many siblings of allergic kids test positive to allergy tests. Parents are then told to avoid certain foods for the sibs--and rightly so. While a food challenge is considered the ultimate in diagnosing a food allergy, blood tests still can indicate severe food allergies. The problem is, they can also indicate seasonal allergies, eczema, etc. Also, with more tests, come more positives--both true and false. I would think that's true for most medical tests--not just ones for food allergies. Plus, every allergic response is different--sometimes even in the same person. Can there be false positives? Of course. They exist for every medical test out there. But does that mean that all positive blood or skins test are false? Sadly, no. It's not that simple. More research is needed, obviously. Better, more conclusive tests have to be devised so that people don't have to restrict their child's diets and frankly, entire lifestyles without cause. What concerns me is that for whatever reason, many in the general public want to dismiss severe food allergies are a conspiracy between allergists and neurotic parents. (For the record, all of the allergists my family has worked with have been sensible and caring.) Despite being well-written and often illuminating, the WSJ article gives parents that much more to worry about and adds fuel to the detractor's fire. 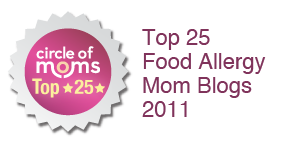 ("See, food allergies aren't really that big of a problem.") It's hard enough to get people to listen and take food allergies seriously. That's the downside. However, if some people are truly not allergic, I hope they are "liberated" and get a correct diagnosis. That would be great. I'd also like to see a cure happen, because, like many of you out there in my shoes, I don't have to question if my child's allergy is "real" or not. I know that it is--reactions speak louder than words. I hope everyone doesn't let all of these news stories rattle them--you know we haven't heard the last of this. Talk to your allergists and keep being cautious until you know you can do otherwise. Tickle Your Tummy Nut-Free Treats! As many of you know, baking is a must for those of us with nut-allergic kids. Bakery goods are off-limits so we've got to be ready to provide a yummy treat for classroom parties or birthday celebrations. I don't know about you, but I don't have Martha Stewart-style decorating skills. I can do the decorating basics and make cakes, cookies and cupcakes that taste good, but when it comes to the finer points of decorating, it's time-consuming and tricky. Plus, let's face it: we don't always have the time to whip up a beautifully decorated baked item at a moment's notice, but we hate for our kids to miss out on bakery quality, decorated goodies. That's why I am so thrilled about Tickle Your Tummy (TM) nut-free treats! This Canadian-based company churns out beautifully decorated cakes, cupcakes and cookies that are 100% nut-free. The best part is that these treats are available at Whole Foods markets throughout the country. You can also get them via mail order. There are a lot of online nut-free food bakers and food manufacturers that I love, (just check out my links under "Nut-Free Foods") but how great to be able to swing by Whole Foods and pick up these treats on the spur of the moment? That's something that we can rarely do. Tummy to friends, family and classmates' parents who want to offer a treat that nut-allergic children can enjoy. In fact, my number one question that I get from non-allergic families is "Where can I find nut-free baked goods?" Visit your local Whole Foods to locate these treats--they should be near the bakery section of the store. And if you don't see them, ask the store to order them. Thanks to the La Grange, IL mom who alerted me to these tasty treats! As parents of kids with food allergies, we have a lot of extra stress when it comes to keeping our kids safe. When a common food can cause a life-threatening reaction, that kind of comes with the territory. But have you ever wondered what it feels like to be on the receiving end of that care and concern? It may not always be what you think. Check out this eloquent essay from the FAAN website, written by a 29-year-old who has suffered from allergies to dairy all of his life. Titled, "Creating Compromises," this article was eye-opening to me and confirmed that helping my daughter learn to be independent with her own allergy care is the right way to go. And it's never to early to start. I am so impressed with this young man who is living proof that kids can learn to deal with severe food allergies and go on to lead healthy lives. Read it yourself and see what you think. While sifting through the family pictures the other day, I began thinking about how far we've come with my daughter since her first severe allergic reaction and nut allergy diagnosis at the age of 4. 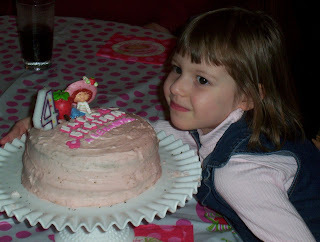 The birthday cake photo is a picture of her a few months before her first, life-threatening reaction. We didn't know about her allergy at that point--the homemade cake is there because that's what she wanted! (A lucky thing she likes mom's cakes, as it turns out). The first picture is her happy, sassy, self, nearly 10 years old. She's doing really well and we've managed the allergy--with her help, I may add--better than I thought we would when I first witnessed the allergic reaction that shook our family to the core. I know that many of you have young kids who have recently been diagnosed and I remember what a frightening time that was for me. You feel alone and worst of all, you feel that your child can never have a normal social life, school life--any kind of life that you believed they could have. That's what I thought at first and thankfully, I was wrong. Your child can thrive with a severe nut allergy. 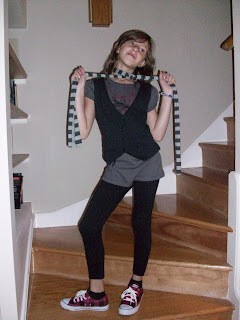 As my daughter approaches her 10th birthday, I've been remembering all the fun things she has done on her own--things that I thought a child with a life-threatening food allergy possibly could not do. However, my daughter has done so much. She's been having a great life, just one that's a little bit more cautious with food. For example, my daughter has flown on an airplane, participated in Girl Scouts and Girl Scout day camp, gone on many play dates without me, been in dance classes and performed in shows, gone to summer science and computer games camp, moved to a new school and made new friends, joined Student Council and other extracurricular activities, joined the family for restaurant meals, eaten lunch at school, gone on field trips without incident and much, much more. Because of this blog, she's even been interviewed for our local newspaper. Is there ever worry about her nut allergy on either her part or ours? Of course. And it will always be there. But I think a little worry (and I said a little, too much is not good!) helps us to keep our guard up and helps her stay reaction-free. The one thing we know is that there are no guarantees, so we must always be vigilant. However, when things goes well, I'm willing to be that we celebrate a little more than families without food allergies might do. We have many more challenges ahead of us as she grows and becomes even more independent but I'm happy about all that she's overcome so far. And if we can do it, you can too. What's All the Fuss About Air Canada's New Allergy Policy? Late last week Air Canada released a story about it's new policy with regard to nut allergies. Read the full story here. Air Canada, which does not serve peanuts but does serve tree nuts, will now offer a buffer zone of 3 rows for passengers with severe peanut and/or tree nut allergies. This is because they do not ask passengers not to bring these food items on board, so nut-allergic passengers will still be at risk. The buffer is intended to keep severely allergic people from having reactions in flight. I'm not sure why there is a furor now taking place in Canada over this policy, since many airlines already either don't serve peanuts in flight or they also employ the buffer zone policy. What's the big deal? It also used to be a grand tradition to smoke on airplanes, but that "tradition" is gone and what of it? Maybe our lungs are a little cleaner than they would have been. The other big argument about peanut/nut policies on airplanes is that, because airplanes are a public conveyance, those with allergies have no right to be accommodated. However, I would argue that because an airplane is a public conveyance, everyone that can be accommodated should be. It's not going to harm a non-allergic person's health if they don't eat peanuts or tree nuts for a short period of time--it will harm an allergic person to have too much exposure to these foods. Of course no airline can guarantee that you won't have an allergic reaction or that some passengers will insist on bringing nutty foods on the plane. But the airlines set the tone--if they make a policy and stick to it (like no smoking) then people will just get used to it and accept it. Airlines already accommodate requests for many common and potentially serious allergies that can cause respiratory distress, not just nut allergies. People allergic to pets should know that many airlines won't allow more than 4 pets in the cabin and will reassign seats for allergic flyers. Also, some airlines state that people with sensitivities to perfumes may change seats. Check this airplane policy guideline from Allergic Living magazine for a list of airlines and their policies. Peanut and tree nut airline policies and the public's negative reaction to them can be upsetting for parents and caregivers of nut-allergic kids and for the many allergic adults who fly for business or pleasure. However, just like no smoking policies and ramps/parking spaces for physically disabled people have become accepted public policy norms, this big airplane brouhaha will someday blow over. The idea that people with nut allergies can solve the problem and "choose not to fly" as many who don't have allergies themselves have suggested, is discriminatory and unrealistic. For example: Can you imagine, in this day and age, saying to a person--"Sorry, because you're in the minority, we can't make this public building accessible to you. You may choose to avoid public buildings. That's your choice." No--of course not. But back in the 1970s, people protested making buildings (and parking spaces) convenient to physically disabled people. Why? Because they were a "special interest group." Sound familiar? As passengers requiring nut allergy accommodations, we should feel free to ask for alternative snacks to be served or buffer zones to be offered. Tolerance doesn't happen overnight, but policy changes made for the health of passengers need not further divide us. It's just peanuts, after all. Have a nice flight. The weekend is here, we've got record cold temps in most of the country and winter is pretty much here to stay for a while. So how 'bout some S'Mores? A few days ago my husband went to Whole Foods to get ingredients for a seafood paella (almost worth another blog post--it was great!) and my youngest daughter started asking him for marshmallows to roast in the fireplace. Well, Whole Foods isn't exactly a marshmallow mecca, but he did finally manage to locate these tasty little numbers! 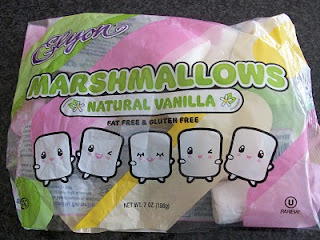 Elyon Marshmallows are kosher and gluten-free. They do not use gelatin, egg or dairy ingredients as marshmallows often do, so people with egg and/or dairy allergies can enjoy them! Oh and they're also gluten-free. Still, a warning to people with fish allergies--there is fish gelatin in these marshmallows. I know, sounds funny but you can't taste it. It's there to replace the egg and dairy gelatin, so if you or your child has a fish allergy, don't go for these. The marshmallows do not contain any nut ingredients, either, and after a spin to the company website it looks like they don't produce nut-containing candies. I've got an e-mail into the company for clarification but right now it's looking good. I wanted to post about these since a growing number of you are facing gluten intolerance and/or dairy and egg allergies in addition to nut allergies. Find these guys (and is that package cute, or what) at Whole Foods like we did or check the Elyson company website for more locations. Anybody that reads this blog regularly knows that I love reality TV shows that deal with cooking and chefs. I do a lot of cooking at home and also get a lot of inspiration from these shows with regards to recipe ideas and family meals. Plus, it's fascinating to me, as the mother of a child with life-threatening food allergies, to discover how much chefs know or care about food allergies. How do kitchens cope with allergy requests or issues "behind-the-scenes?" And are food allergies even on these people's radar? In the past year, especially, I've found more and more cooking shows to confront food allergies, dietary restrictions or food intolerances. Bravo's "Top Chef Masters" handled a Hollywood actress's gluten-free, non-dairy dietary requests (it wasn't clear if this was a life-style choice or medically necessary, but still) and last season in the BBC America show "Last Restaurant Standing" aspiring restaurateurs were asked to serve diners with celiac disease. What you learn from these shows is that the range of knowledge about food allergies and intolerances on the part of chefs is vast. Everything from complete ignorance to savvy understanding -- and everything in between. I learn from these shows to never assume a chef knows or understands the severity of any food allergy and that's why I follow my doctor's advice to serve my daughter only simple, basic foods when at a restaurant. Well, the latest Bravo TV chef show offering "Chef Academy" featuring the world-renowned chef Robert Novelli left me with a very fishy feeling after I viewed an episode in which he questions the reality of a contestant's squid allergy. She had been working with squid and her face and eyes started burning and she was feeling really ill. She also had pretty bad facial swelling. (In the clip I'm about to share, that had gone down somewhat but if you saw the whole episode she also had big facial hives.) The contestant describes to Chef Novelli how she believes she needs an adrenaline shot (Epi Pen, basically) to counteract her reaction. Here's the brief clip if you'd like to "watch what happens." You'll see that the chef's assistant had to look up food allergies on the Internet in order to prove to him that shellfish allergies can be life-threatening. OK, the chef didn't know that???? So scary. Or maybe he just doesn't care. Even worse. In the full episode, one of the other contestants (a much more inexperienced chef than Novelli, by the way) is shown to explain to the camera that shellfish allergies "and peanut butter" (her words) are two of the most serious food allergies. Also, to clarify when you view the clip: the chef keeps talking about Suzanne, the contestant's "two red dots." No, he's not referring to hives. The contestants are kicked out of the Academy after receiving 3 red dots. Actually, I'm glad that this show aired and that the chef's very insensitive reaction to a person's food allergy was shown. I actually believe that people will learn something from this--maybe they've never seen someone have an allergic reaction. A food allergy reaction just isn't pretty, even when it doesn't progress to anaphylaxis. Chef Novelli may think he's all that but he would do well to have a little food allergy education if he wants to truly be "world-class." I wish Bravo had included the FAAN website at the end of the show so viewers would know where to go to learn more. Did anyone see this show and if so, what did you think? Happy New Year from The Nut-Free Mom Blog! I've been light on the blogging over the holidays but I wanted to be sure to say Happy New Year to all of you, my loyal readers and those who've just discovered my blog recently. I hope that my blog has been helpful and that you keep your questions and comments coming. I learn a lot from all of you! 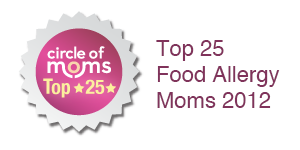 Also, as some of you may know, this is the 2-year anniversary of The Nut-Free Mom Blog. I can't believe it. When I began this blog in January of 2008 I had a feeling that a lot of parents were going through the same things with nut allergies, having the same questions and the same concerns that I was. However, I wasn't prepared for the amount of readership I've received! I'm honored to have become a source of support for so many parents and caregivers dealing with nut allergies--and I've also heard from several adults living with nut allergies. I'm happy to hear from you all and glad to be a resource for you. 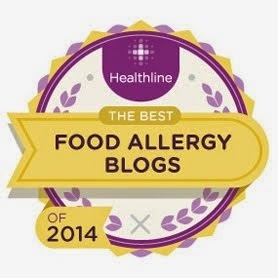 I'm also happy to have "met" so many other food allergy bloggers. I appreciate all you do. And of course, without you, the readers, there would be no Nut-Free Mom Blog. Thanks to everyone who has e-mailed me, commented on a post or asked a question these past two years. Also, thanks to all of the allergy-friendly businesses who contact me about their terrific, nut-free foods and other products. By supporting these businesses, we make nut-free living a little easier. Here's to a happy, healthy nut-free New Year for all of us! Thanks for reading and stay tuned in 2010--there's lots more to come!